For any gardener in Maryland last week, your dreams were of rain. Wasn’t it just a few months ago that we were soaking, gross and saturated? WAY too much rain? Mud in my chicken run was so deep I worried for the health of my baby chicks! But now those chicks are teenagers and experiencing days of 90-100 degree heat, burnt up grass, baked hard ground, and hot sticky nights. Same for the gardens, where once lettuce was so lush, loving all that rain. So, Hooray for my hose! SUN + WATER = FOOD!! There is not much I can do when weather is too wet to help plants fight back the attacking mold and rot. But in the bright, sunny, too hot I can supply mulch and water – and voila! Even in last week’s heat I added pepper, tomato, and herb seedlings into our front walk flower bed where squash vines already ramble. Thanks to lots of light fluffy leaf mulch (leaf pro or leaf grow, from my local nursery) and my hose they have survived their roasting first week looking good. I have also been using the hose to BLAST the hoard of proliferating junior SQUASH BUGS off leaves and vines. Not sure yet if this is enough to get rid of them. Squishing them is best of course, but takes a lot longer. While I am there, I check both sides of the leaves for EGGS, scraping or ripping them off. Everything likes to eat squash plants. Squash bugs, caterpillars, winged bugs I cannot identify but detest… it’s a birth-place, bar, and restaurant in one. All that juiciness. High heat is stressful. Plants, hens, bugs, everything gets cranky and aggressive. Getting enough water is prevention and cure for many garden woes. The plants I keep watered are the ones that thrive, I remind myself, and keep producing food for us. True, water is a precious resource, and I have a bad habit of forgetting to turn off the hose…. We are lucky in this part of the globe to have a hose to turn on at will, when in many parts of the world getting the daily water is a challenge and chore. But eating from the garden means watering. Why do I so often get busy and forget to maintain the gardens in midsummer? Note to self: 1. yes, be grateful, but 2. go get that hose! The same holds true for chicken health in the heat – mulch under foot and plenty of clean water. My two month olds are happy, healthy, and independent, not too picked on by the older hens. I rotate the flock between 6 paddocks, which includes the front and back grass. Edward is not at peace with chickens on lawns. On the lawns means access to garden beds. Chickens usually make a mess, raking through the mulch at the garden bed edges, uncovering roots, intent on their constant search for BUGS. But, wait…wait. Wasn’t I just complaining about bugs in the garden? So you see, it’s a trade off. This is supposed to be a bad year for ticks. Our tick tally is up to four so far this season. I would rather have to pull the gardens back together than have a husband with Lyme disease. So — RELEASE THE CHICKEN PATROL!! One more great reason to keep chickens (did you need another?) is vigilant insect management. Surprise! As I photograph, Old Mama hen puts her body between mine and her former babies. Maybe she is still on the job, part time protecting them? PPS – we finally got some rain in a thunderstorm yesterday! PPS – we got a weekend of pounding rain and thunderstorms. PPPS – Looks like a week of rain ahead. Oh-oh. Shelve the garden hose. Post the blog anyway. Dream of sunshine. My lettuce seedlings accuse me. I skitter past the trays under the grow light where limp green straggles out over the edges of a plastic pot, overcrowded and desperate for soil and sun. Or more water, to be honest. More water would do it. “Soon,” I think to them. Guilt, guilt, guilt. I love this crazy slightly manic time of year, with more and more sunlit hours per day, and the incredible energy of the sun feeding gardener and plants alike. I didn’t know until recently that I (like so many modern folks) am “low for vitamin D.” Maybe this is why my gardening hours leave me energized, even if my back hurts from overdoing. My back recovers easily over night, ready for more the next day. (Shout out to Edward here, since my spinal health is largely due to my kind husband, who gives a great deep tissue massage even as he is falling asleep.) I am sorry not to keep up with my writing up as I do in the colder seasons. But being outside is tonic for the soul, mind, and body. My chiropractor sees more of me the more hours I spend at a desk. Lack of varied activity seems far more injurious than the strain from pushing wheelbarrows, hammering stakes, yanking weeds, or hoisting clumps of heavy Maryland soil. My lettuce seedlings may not look too great but the lettuce and kale garden is going gangbusters! These were plants I couldn’t resist buying way back in March. The bugs and snails haven’t found them in this new location. Yet. The chickens have been resentful but prevented. And the evil bunny rabbits can’t get in either. My kale leaves are yet un-chewed. Very satisfying. Two salads so far from these luscious leaves. This success has made me bold. I put the broccoli sprouts out in the back kitchen garden, surrounded by an army of marigolds. However, now that I think about it, last season that bed of baby broccolis had kale in it… kale that was completely skeletonized by unknown forces. Marauding hordes of slugs, snails, chickens??? We never got a bite. Broccoli is kale’s cousin – so these poor broccolis are far less likely to thrive. The attackers will be back for more. Damn. EVERYTHING – except humans – LOVES TO EAT KALE AND BROCCOLI. AND CABBAGE. Maybe I can pull them out today, and stick them in the middle of the garlic bed, where the chickens got in and pillaged and made a space…. I am trying to learn more about grouping my plants, companion planting they call it, the way nature does it. I will have to check that kale and garlic are friends. (They are.) Fascinating that some plant species like each other, and grow better in each other’s company. And that other plants actually inhibit each other’s growth. Just like people — didn’t I hear somewhere that plants and humans share more DNA than they don’t? But the really big news from the Simons Gardens is the new chicks under our broody golden Maran. Yesterday I went with daughter Freya and picked out five one day old chicks at Gambrills Feed Store, three of a new breed, blue hens from the Czech Republic. The little gals are a beautiful blue gray fuzz for now. They are supposed to lay lots of blue eggs. And then two good old Buff Orpingtons. I am a sucker for Buff Orpingtons, sweet tempered, good layers, and excellent mamas. I wish I had captured a photo of the five chicks last night, but now you will have to wait, since once those chicks go under mama (stealthily traded for the eggs she sits on, in the dark of night), that hen keeps them close to her until they are all bonded and she feels all is well. Chicks have to kept 95 degrees warm. My other adoptive mothers have known just how to manage letting the chicks go, calling them back to get warm, teaching them to forage for bugs – so I am hoping for another success. Photos soon! For now, it’s time to dig! Out into the gardens this beautiful cool morning, to set some lettuces free. Too many eggs. YES. This is a problem I can LOVE. After months of pitiful laying, my flock is cranking out eggs even before spring begins, as the hours of sunshine per day increases. I removed two of the mean hens from the flock, who were drivingthe other girls away from the food. (Butchering them was Saturday’s project; they are in the freezer now.) with two fewer hens I am getting more eggs, so i think that was the right call. Plus I have been encouraging them with extras: organic grains and groats, kale, and occasional yogurt. I am also encouraging their G.I. health (my hens are prone to vent gleet)(yes, still) by adding livestock probiotics, brewers yeast and garlic powder to their feed (thanks to Lisa at Fresh Eggs Daily for that info!). Yes, they are laying well – but this time I will not be fooled. I will not get excited and start giving away or selling the extras! No no. I am gonna save them for the fall/winter when nature tells the layers to lay off. Twelve to ten average layers can generate enough eggs in a year for a family of four, but only if you preserve the extra egg while you have it, in spring. And yes, you can freeze eggs. I may not love the plastic of modern life (see my rant Are Your Clothes Killing You? ), but I do LOVE GOOGLE SEARCHES. While I waited for the red traffic light to change yesterday, I plugged into my cell phone “freezing spring chicken eggs.” (Of course I parked the phone as soon as the light changed! tush! How can you ask!) My Google quest lead me through a series of methods of preservation, from old-fashioned (which sound scary) by storing in tubs of salt, or by rubbing fat on the shell, or preserving in wax, to a backpacker who dehydrated eggs successfully, and found them functional on the trail. Bear in mind that clean eggs that have not been washed are ok all by themselves at room temperature for a loooong time, contrary to what a modern refrigeration-dependent Amercian might think. Eggs come out of the mama coated with a protective substance — which American egg industry industriously washes off, thereby rendering the egg defenseless to bacteria. (sigh) In Europe and South Africa eggs are stored in baskets, not refrigerators. How else could eggs in a farmyard sit under a mama in a nest of dirty straw for weeks, and not go rotten, thereby poisoning the embryonic chicken inside, waiting to be hatched? You can’t leave then in a mud pile, not in the full sun, but room temp is not a problem. The Egg preservation answer I WANTED was: YES DEAR WYSTAN! YOU CAN LAZILY JUST POP THOSE BEAUTIES INTO A ZIPLOCK IN THEIR NICE CLEAN SHELLS!! However, this appears NOT TO BE TRUE. Or at least not to be approved. The FDA advises against freezing eggs in shell, worried about the possibility of transmission of bacterial contamination from shell, when freezing eggs crack. And freezing eggs do crack – I already know that. Another reason not to freeze in shell is egg yolks do not always play nice after it is thawed. The yolks can toughen up and refuse to mix with the whites, they say. So most Experienced Chicken Egg Freezers stir the whites and yolks together, sometimes adding a little salt ( 1/2 tsp per cup – I used 1/4 tsp per cup) and store in a tub or a ziplock in the freezer MARKED for quantity. (Be sure to mark what it is!) Then when ready to use, thaw slowly in fridge. They say the frozen egg prepared this way, can be used for baking and eating just fine. Since I have been avoiding evil plastic touching my food as much as possible these days, I will try freezing some in glass, and some in plastic in case that doesn’t work. Let me add here that what the FDA doesn’t seem to know about food safety would fill a large book. Like most government agencies, they are worried about law suits and C.Y.A. and the stupid factor: what is the worst possible scenario here? The FDA does not give accurate advice on the subtleties of growing and eating your own food in a small controlled setting (ie not a factory farm). Intelligent and educated people READ UP, therefore know better than to store a dirty egg, or to consume the eggs of sick chickens. Right? The eggs of small flock chickens properly kept are generally healthier and certainly tastier than anything you can buy in any store anywhere, organic or not. However there are some dumb people keeping chickens. I have seen some very sad small flocks, standing in small muddy, unmulched enclosures, without access to grass, or bugs, or sun. We need the FDA regulations and suggestions. And we need to educate ourselves to do BETTER. I will let you know how thawing and eating my frozen crop works out…next fall! Inspired by Laurie, a brand new reader of this blog (find her at Meditations in Motion), I REALLY DID locate my supplies to start seedlings during the snow storm. A hurried walk in the dark and a faltering flashlight revealed the seed starter and potting collection, buried at the back of our shed. …and where, I refer to our Garden Plans book. We keep track here so we rotate crops ( ah, the endless effort to fool bugs). While tomorrow’s lavender slumbers on! It’s the Olympics, so it must be time to start seedlings. That’s my measure. And whereas last week it was still solidly winter, this week Maryland will begin her flirtation with spring, rising to 70, before dropping us into the 30s again. Another signal. Maybe a dare: get ready! Suddenly, I find I am interested. Until this week the yard had become something I just hurried through. Until this week there wasn’t much happening there except the flapping of unfurling plastic sheeting around our failed temporary greenhouse creation. It’s rough being mocked by a piece of plastic sheeting. Last issue Suburban Growing took a little sidetrack from it’s stated purpose and looked at the horrors of plastic for the environment: what plastic does, and how much of it is out there in all our waterways around the world and in our drinking water. Tiny particles. Cancer causing. Given my low opinion of plastic as a material, anyone would ask how did we wind up with a massive monument to plastic in our garden? Sometimes we learn the most via failures. I’m hoping. 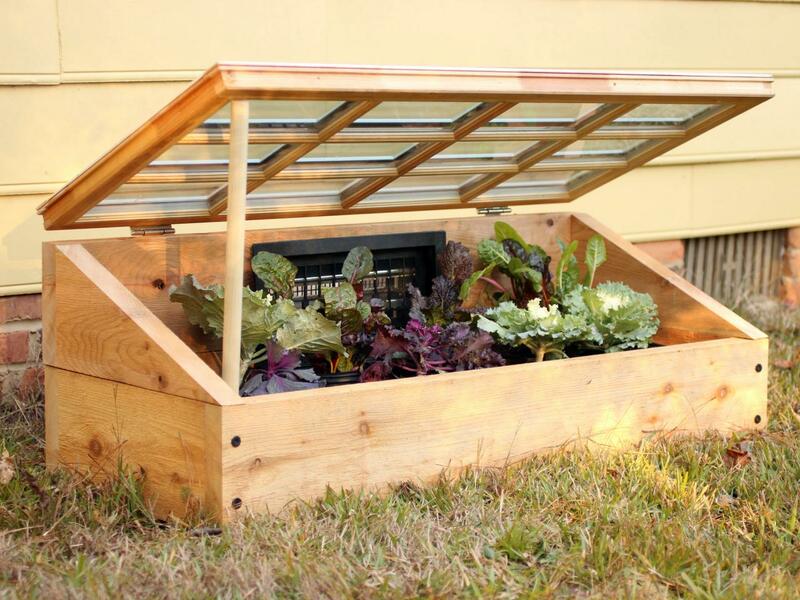 The idea was to extend the growing season in an affordable way. The reality has been as ineffective as it is ugly: the wind pushed the plastic walls in on all sides, the chickens pushed in below and polished off the over-wintering greens, and the ice broke through from above. Oh and the plastic degrades: after a couple years of exposure to sun and water, the degraded plastic will not be suitable for recycling when we’re done. One more for the ocean. Oh yuck. But we have big plans for the garden beds this growing season. The chickens we have decided need to go to a summer run and coop for the summer, under the shade of our tulip poplar. Then in their current run we will build up and plant garden beds, on the south side in full sun! We could start easy this spring (we could, right Edward? easy!) with some old glass storm windows that I picked up from the end of someone’s driveway years ago. (I know – nightmare. Yes, it’s true, we have been storing these old windows in the shed for years.) The thing to know about using old storm windows for a cold frame is to remove the old paint first before you set it over a garden bed — because old paint contains lead. I am hoping to remove the paint with a power washing and scraping under the pine tree out back, in a garden that does not grow edibles. I will need to remember cover that dirt with other dirt, and mulch heavily too, since my chickens root around back there. And what about the plastic sheeting? I think we may be able to use it still, as a two-sided wind break to increase the temperature on that south side and start some green beans climbing their poles early. Edward says usually they go in in May. It all depends on warming the soil enough to germinate beans, which are not cold weather lovers. But green bean are tougher than tomatoes or peppers. We eat a lot of greens beans, and they generally like our soil, so this would be a good food to make the effort to grow as many plantings as possible. (We have been getting 2-3 plantings during the summer.) One of the problems for planting early is the heavy rains we get here in spring – seeds rot – so the plastic sheeting could be used as a roof – even if the wind blows it about it could still shed some of the rain off a raised bed. A lady who saves and stores trash-picked storm windows is not going to throw out a pile of plastic sheeting! And when it finally degrades into pieces, unless they have found a better way to handle trash, I may bury it under the pine tree out back. R.I.P. – No reincarnation for you. Shampoo Bars by Lush – these shampoo and conditioner bars are AMAZING smelling, and easy to use. (You can tell they smell good, since Owen took a sample.) They are expensive upfront, although my daughter tells me they last forever, so are much cheaper in the long run. The Avocado Shampoo and Conditioner bar – the triangular one – is my favorite for smell, but will take a little getting used to since it doesn’t lather (the conditioner is in there too). The other lathers wonderfully. So far they work great for my hair. Trash Can Traumas – I am trying out Lawn and Leaf Bags at the grocery store. Pretty affordable, but way too big. Not sized for kitchen trash cans. I chop them down, but My Simple Human Trash struggles to function. Inventors take note!! I have searched, and this product does not exist. Yet. I will also continue recycling old feed bags from the dog and chickens – they fit pretty well. The key is what to do with WET garbage in paper bags – so far I am bagging it separately, in a small bag. But most of my non-compostable, non-recyclable trash is dry or only moist. Here’s our Garbage Breakdown: most veggie trash and leavings go to chickens; Non-chicken-appropriate Veggie garbage goes out to compost pile; metal, paper, glass goes to recycling bins; oil I pour out in garden behind the grill under the old azalea out back (she’s tough). Spring is coming – and plastic is going. It was the choking sea plankton that got me. The topic for Suburban Growing is gardening: growing your own food in suburbia, and tangentially health. During this off-season, while our gardens rest peacefully covered in leaves (that’s the goal and I’m confessing nothing) and snow, we have an opportunity to address larger issues associated growing and eating food. Issues such as Microplastics, a term I had never heard before I caught part of a radio broadcast last November. I have always disliked plastic (ask my family), but the idea that tiny filaments from clothing are contaminating our water was news. As I digested the unwelcome implications with my holiday meals, I did more research and tried to check facts. Well, I knew about all those horrors. But I did not know about MICROPLASTICS. Microplastics are invisible shards or filaments which break off every time we wash our rayon, nylon, lycra, orlon, __ (fill in the man-made-fiber blank) clothing. Wastewater plants have never been set up to capture these tiny particles. They just cycle round again, concentrations growing greater, I assume, with every passing year. A separate study done by the Republic of Ireland found microplastics in Irish well water (The Guardian, Sept 5, 2017). Our buddy the sea plankton at the top of the page is choking on a single filament that extends thru his entire microscopic body, as photographed by . And he is one of 1000s that scientist Richard Kirby has seen expiring in just this way (Invisibles, by OrbMedia). All this means that while I have been trying to eliminate a plastic bag here or there, avoid plastic wrap, tote my drinking water in a reuseable bottle, nevertheless I have been bathing, drinking, and eating invisible plastic particles all my life. Very likely my body tissues are full of it. OK, so what, you say. Enviro-hysteria. So this: plastic is considered to have estrogen mimicking potential. Of course I would think that, given my prejudices against the stuff. But the NIH says most plastics leach chemicals. (NIH report, July 2011). False estrogen, that is plastic acting like the hormone our bodies make, has been associated with “breast cancer, ovarian cancer ADD, and the feminization of the male species,” I learned from NPR. While the right to choose one’s own gender is a hot topic these days, from the scientific standpoint you must have a female and a male in any species to allow it to continue – hence the concern. No two sexes, no new life. (NPR broadcast, Plastics are Forever, Nov 1, 2017). SO even if the plight of our buddy the sea plankton (foundation of the oceanic food chain) does not move you, the reality of pervasive breast cancer may. It does me. What about water filters? Can a Brita remove microplastics? It seems so – but don’t quote me. It’s long been known that infinitesimal bits of plastic get into our food from containers. The process is called ‘leaching’ or ‘migration.’ The chemical industry acknowledges that you can’t avoid this transfer (…) almost any plastic container can be expected to leach trace amounts of plastics into food. Well, this wasn’t a cozy post to curl up by the fireside with – next time, I promise. I hope you not only read the piece, but share it, and that it galvanizes you to action! Let’s get creative! How can we re-see our modern world without plastics? Let the stores you patronize know if you want them to abandon plastics, or even that you will not buy from them unless they find other ways to transport and present goods to the marketplace. Make choices for your long term health, and mine. And our grandchildren’s. I gave you a lot of sources to check. If you are going to only look at ONE, let it be this video: How Dangerous is Your Drinking Water? I pruned the lower leaves of the Brussels sprouts. They could've landed in the compost heap but I thought I'm going to eat them. A quick steam of the leaves then filled with a shredded chicken, rice and bell pepper mixture. Warm or cold they are delicious. This has not been a stellar year for the Simons gardens, as I may have mentioned before. And even so, EVEN SO, once you start really paying attention to what is growing in your yard it is amazing what there is there to eat. For instance, how about this. Scrolling through Instagram (cell phone use has spiked these past few weeks) I found this GORGEOUS photo of steamed Brussels sprouts leaves wrapped around meat and rice. Looks yummy. I thought this even a thing? eating the leaves of plants from the brassica family?? Brassicas are the cole crops, that is broccoli, cabbage, Brussels sprouts, kale, collards, etc. That’s great news for us since we can grow the leaves pretty well. It’s what comes after that just doesn’t work out. At this moment I have big beautiful leaves on plants that will probably never see broccoli heads or Brussels sprout bulbs climbing a stalk skyward. At our house, if the chickens don’t break in and get them, them get MUNCHED by caterpillars — or could it be voles? I went out into the garden with a flashlight tonight, and harvested a quick handful of beautiful Brussels sprout leaves from the two stalks that survived, and chopped them into my Indian/Asian fusion invention (chopped onions with tons of curry, tumeric, and garam marsala, ground meat, diced scavenged thin-walled peppers and last of the green tomatoes, currant, diced Granny Smith) and we ate this over steamed cabbage noodles. (Thin slices of cabbage steamed, another idea that I stole from Instagram, many thanks to Amara and Martin!) I meant to get a photo for you all, but it was so good…we ate it all up without a technology stop in the middle. It was difficult year for the Simons Gardens — first cold, then dry, then very wet, and cold again — just contrary! our green beans, tomatoes, and pepper plants struggled!! — and yet. And yet the soil gave us enough peppers for lots of salads and some to slice up with onions and freeze. The garlic heads didn’t grow large, but three bunches are dried and hanging on the kitchen wall. Jars of dried herbs lie in the cupboards – lavender, sage, oregano, thyme stored with leftover stay fresh packets from vitamin bottles to preserve them. We didn’t get that many cherries from our trees, but more than before. We ate and froze some blueberries, black raspberries, and strawberries. We did great with salad greens! Grew onions for the first time ever.We only lost one hen over the summer, and the little chickens raised by the adoptive mother last spring have laid their first little girl eggs. Then let’s not forget the piles and piles of pruned crape myrtle that I made everyone cut into sticks and stack on the kindling pile! Looking over this year in our gardens as we wrap up our harvest, I’d say yes, in spite of the frustrations we’ll do it again. It can be maddening. But we love growing things. And there is something to be said for learning to let things go, recognizing how little we control, appreciating what good arrives in our basket or on our plate. There is always more to learn, always more to understand about the way weather and soil and insects and even irritating #*%#!! voles operate together, a symphony that we hardly understand. So we make guesses. We chop down tall foliage to create more light, raise beds higher to ease our aging backs, build new enclosures to better rotate the chickens, and set up rain barrels locally in more gardens to simplify watering in the coming year. Even in a suburban garden, you sometimes get to witness remarkable wildlife in action. Such was the case the other day when I turned around while feeding my chicks, to find a magnificent clean up operation going on. Maybe I just identify with beings that stuff their mouths. I really do like and appreciate the snakes on our property just much as I dislike and cuss at the mice and sparrows that invade it, spreading their vermin inside and out. True, those grungy sparrows are just trying to make a living and get dinner — but then, so is the snake. Sometimes I hate August gardening. Or so I say to myself as I pick my way through humid, wet, over-grown tomato plants that tangle with wild morning glory vines. Those crazy vines grow so fast, and twist around and around every vertical stalk or post or fence, through the other leaves, around the other plants, an agony of overgrowth. They scramble my view of any harvest. What harvest? That is what I am out here looking for, after all. Last month I wrote of heat, but this month of outrageous amounts of rain has seen barely enough sun and heat to turn my fat tomatoes red, or my green peppers into green peppers. Ugh. Will there really be NO HARVEST? But I know this feeling from of old. I remember how just when I am are ready to say “After all that work?? Is everything sick and dying?! I quit!” that the plants seem to groan, “Okay, okay” and searching around under those piles of messy, mottled, chewed on, sprawling leaves (and scrambling vines, damn them) yields ripe tomatoes! Green beans! and peppers that you didn’t see at all at first. Suddenly, sure enough, I can bring in supper from our own yard. But this August is a little different. This last week of August, my harvest included some unexpected and unwanted tubers. I did not plant these ones – at least not on purpose. These tubers are in fact breast cancers, growing in the soil of my body along with everything else. To be seeded with spores and growing a harvest of cancer should not really be a surprise for me . Both my mother and my great-aunt fought this same weed of the body. But the mind can play tricks. My cerebral cortex just did not really believe that I would get cancer. Why? Because it would be too obvious? Because I grow and eat a lot of veggies? Because my role as the mother of a special needs young man would protect me? Superstition made me immune. Only, it didn’t. And as surely as the morning glories run wild all over my gardens every summer, my body has been growing a useless and invasive crop. As Edward and I gather in the green beans from the poles this week and watch the acorn squash mature, I am also gathering my energies, preparing to be weeded, and to wrestle out the roots of disease. I am making better habits, getting rest, eating well, stretching and working my muscles. I am reading, educating myself to know my enemy, just as I have poured over pages on plant diseases during other troubled harvest times, trying to plan my attack on marauding viruses, bacteria, or parasites. Will it be chop, or burn, or poison? I favor chopping this time — less toxic, and perhaps more permanent. I will consider all my options. As Edward and I worked through the garden beds over the weekend it was satisfying to rip down useless vine off fences and out of netting, wrench roots from the soil, and watch the liberated plants shake free and breathe. I will think of that as I am healing. But there is still more to the Simons garden harvests this August — can you believe it? What a rich month we are having! The most superior harvest for our family was expected in September – but could not wait. And so in the last week of Augyst she was coaxed from her mother tree, and out into her father’s arms. Four pounds four ounces of pure sweetness. Baby Marlee Faryn Simons was born a wee bit early. Edward and I are grandparents, and before too many more days we will fly into September in the Rockie Mountains, leaving Maryland far behind. For a little while at least.